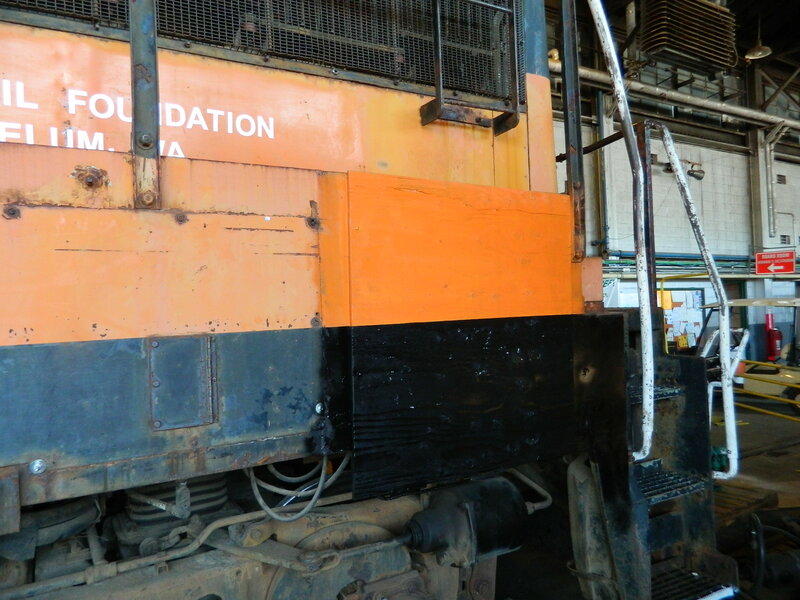 Feather River Rail Society (FRRS) and Cascade Rail Foundation (CRF) volunteers spent Monday, June 9 through Thursday, June 12, 2014 working to finish the preparatory work on General Electric U25B Milwaukee Road 5057. 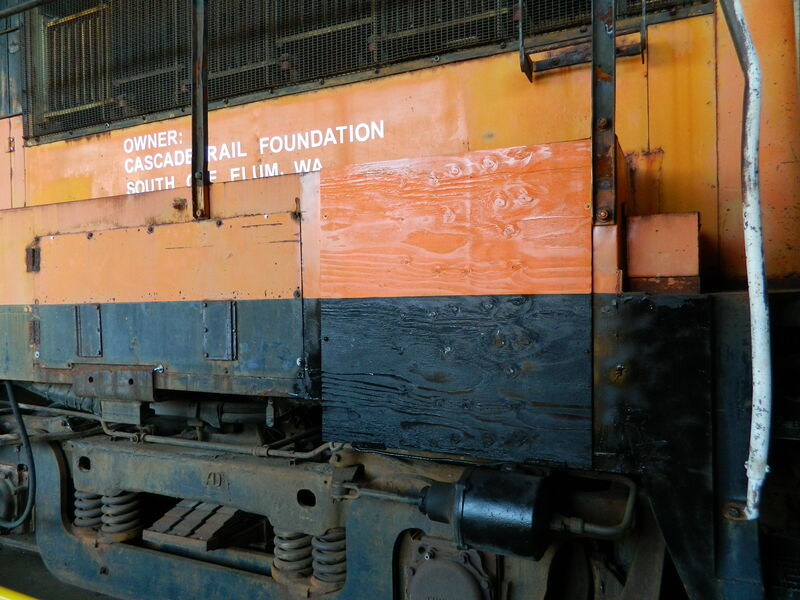 The work during this session was performed at the Western Pacific Railroad Museum Shop (WPRM) in Portola, CA by Wayne Monger of both CRF and FRRS (Member- FRRS Board of Directors), David Elems (FRRS WPRM Shop Safety Supervisor) and Steve Habeck (Vice President FRRS and WPRM Trainmaster). The primary focus of the work session was the air brakes, completing the work started during the October 2013 work session. The primary activity was the rehabilitation and reassembly of the brake rigging and guide assembly around the #3 axle. This included piecing back together of the entire brake hanger assembly on the fireman’s side of the #3 axle, which was missing from the 5057 when it arrived in Portola from the Nebraska Technical College of Sidney, NE in 1988. The locomotive evidently derailed this axle at some time (possibly toward the end of its time on the Milwaukee Road). 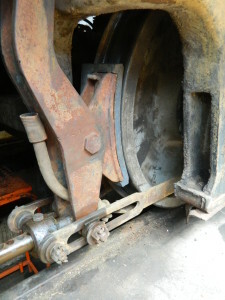 The badly damaged brake rigging was cut off. Wayne was able to assemble a complete working brake hanger assembly for the fireman’s side #3 axle, using parts removed from Alco-GE RS-2 Kennecott Copper Corp 2 during the October 2013 work session on the 5057 and the few remaining useable parts still on the 5057. With the brake rigging and guide assembly rebuilt on the #3 axle, brake shoes were then installed on it. 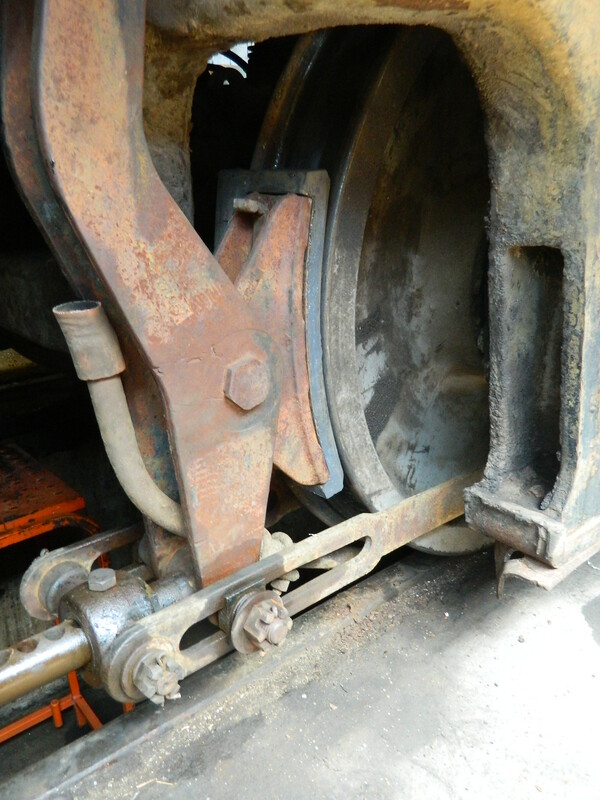 Three used-but-good condition composite brake shoes (recently removed from ex-SP TR6A Quincy RR 1100 during routine brake shoe maintenance) were installed on the #3 axle. Two were put on the reconstructed fireman’s side of the #3 axle and one was placed on the engineer’s side. 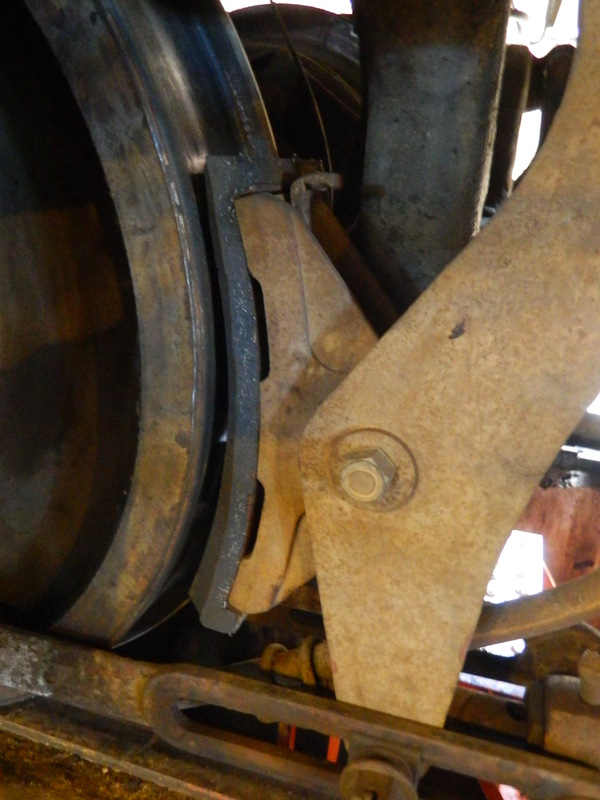 The brake shoe on the inside surface of the engineers side #3 axle was still in place, so it was not removed. Once all of the brake shoes were installed, the air brakes were tested using the shop air compressor (with 70 psi to 100 psi air pressure). David began working the independent locomotive air brake in the cab to start to set then release the locomotive brakes multiple times. 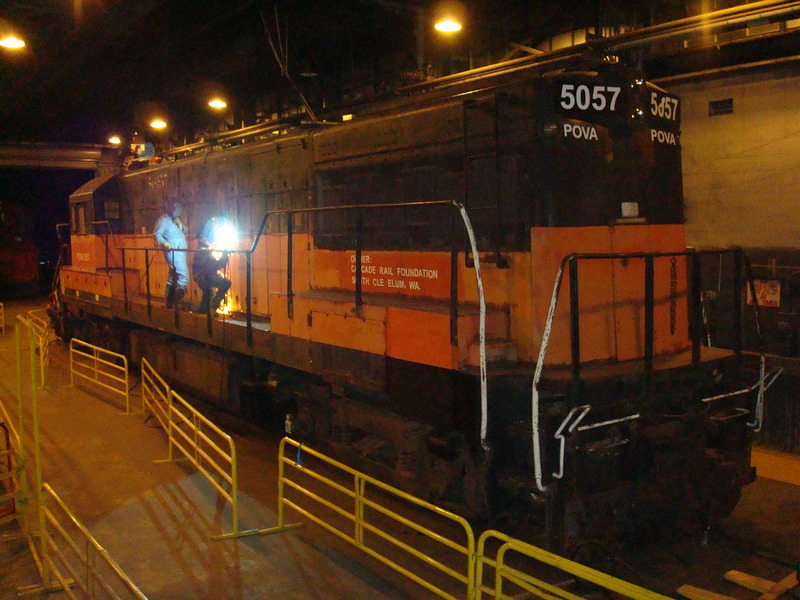 After some initial resistance due to a long period of non-use, all 8 air brake cylinders showed no air leakage and the return springs were strong, snapping the locomotive brakes back to the release point promptly. Inspections found that the travel on some of the air cylinder pistons was well less than 3”, while the travel on other air cylinder pistons was well beyond the 6 ½” maximum allowed. Upon consultation with Steve Habeck, the team determined that all eight of the air cylinder pistons needed to be adjusted so that they had between 4” and 5 ½“of travel. The team also identified a problem with the #3 axle on the fireman’s side. The guide rail anchor bolt and nut installed earlier in the week was bound up tight against the truck frame surface, preventing the brakes from releasing. Further inspection revealed that the anchor bolt on the engineer’s side of the #3 axle was missing. Instead of the required bolt, a steel bar was in its place. 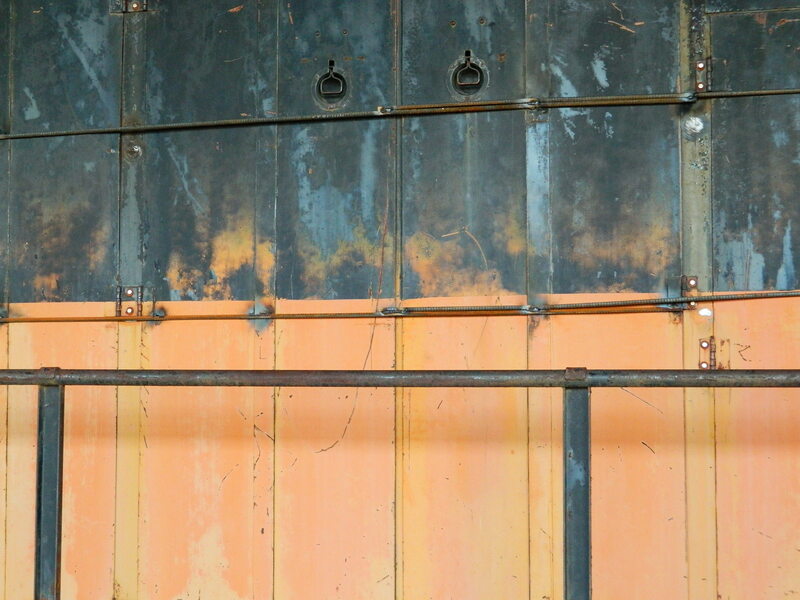 The steel bar had a cotter pin and washer on the visible side, but nothing holding it on the inner surface. The fireman’s side of the #3 axle. The engineers’ side of the #3 axle. 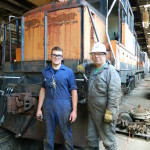 To resolve the problem of the missing bolts, David spent two hours using the locomotive shop metal lathe and drill press to modify the existing bolt and locking nut taken from the fireman’s side of the #3 axle, then found and similarly modified a new bolt and locking nut for installation on the engineer’s side brake system guide rail of the #3 axle. While David was doing this work, Wayne was busy working on adjusting the brake cylinder travel for all four brake cylinders on the front truck (axles #1 and #2). As these systems had not been adjusted in nearly 25 years, it took a lot of persuasion to free the moveable parts from rust and old grease. Wayne also capped off a leaking airline in the locomotive cab – from the air supply line to the air horn valve and handle assembly that had been improperly removed in the past. When David was finally successful in modifying and installing the anchor bolts for the #3 axle brake system guide rails, both Wayne and David performed the brake cylinder travel adjustments on the rear truck (axles #3 & #4). David returned to the cab and worked the independent locomotive brakes several times; all brake systems on the four axles responded well. Later in the day, one of the brass ½” air supply lines to the windshield wiper assembly in the cab that had been leaking finally came loose and was blowing air, so David put a cap on that air leak. After this last minor air leak was plugged, the locomotive main air system held pressure very well. 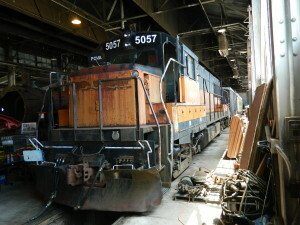 During the work session, Wayne also replaced the numberboards on the 5057. The original plan was to install replicas made of frosted plastic for the trip north. At the recommendation of FRRS VP Steve Habeck, Wayne made four temporary rounded 3/8” plywood numberboards instead. These are less likely to be removed by thieves. The plywood was cut 1” larger than the numberboards to fit over the four body openings. The numberboards were painted a semi-gloss black and 9” white vinyl self-adhesive “5057” MILW-style numbers were applied to the surface of each. 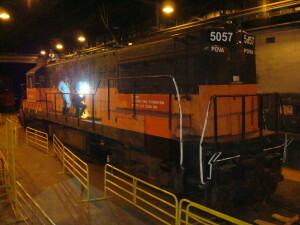 They are nearly identical to the original 5057 numberboards. Each was carefully installed using 5 self-tapping metal screws into holes drilled into the body steel around the numberboard openings, and then were sealed against water intrusion by a bead of clear silicon sealant. These self-adhesive numbers were not sticking very well to the freshly painted plywood surfaces, so different numbers may need to be applied (or painted on) later this summer prior to the 5057 departing Portola. 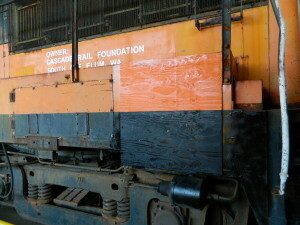 The only major task not completed was the work to secure the hood doors of the locomotive. 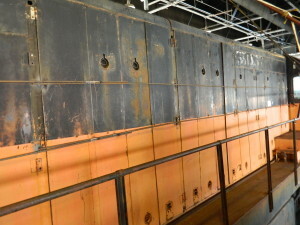 The plan is to weld two sets of steel rebar across the outside of all locomotive hood doors, tack-weld the rear access door shut, and tack-weld the five electrical access panel doors shut under on the fireman’s side of the cab. 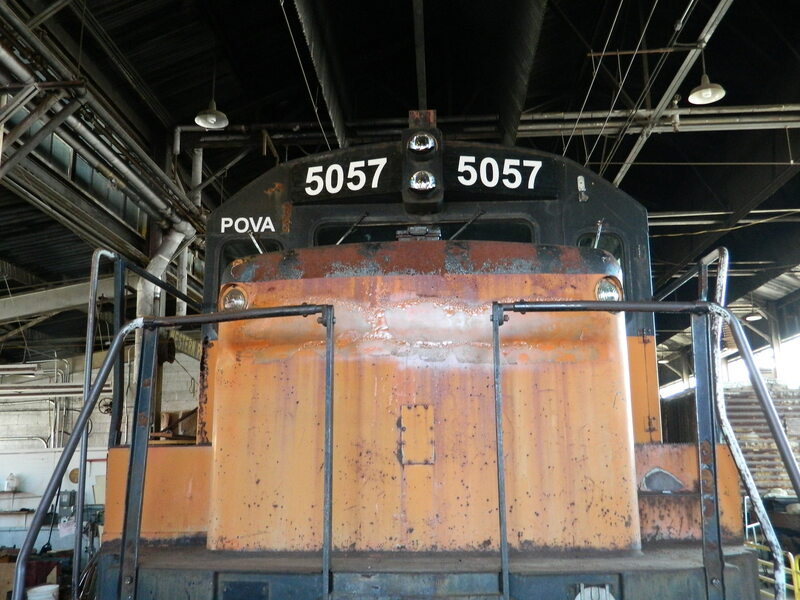 Another task yet to be done is attaching the “POVA 5057” AEI tags to both sides of the 5057. Other than these two last items – and barring any problems/questions that may show up during pre-movement inspection – the 5057 is ready for shipment from Portola to the Pend Oreille Valley Railroad (POVA) shops in Usk, WA! On Saturday, July 12, 2014, Wayne Monger and David Elems were able to weld the two rows of steel rebar across both sides of the engine hood to hold all the engine compartment doors in place for the upcoming trip from Portola to the POVA shop in Usk, WA. 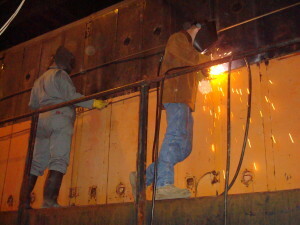 Welding the doors shut with rebar. Bob Sims photo. Wayne and David welding the rebar to the hood. Bob Sims photo. 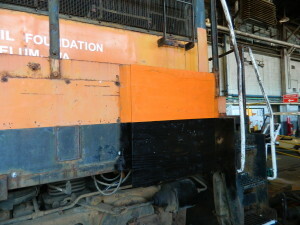 They also covered over the missing access panel at the rear end of the locomotive on the fireman’s side. This is the area containing a home-built centerplate lube system. 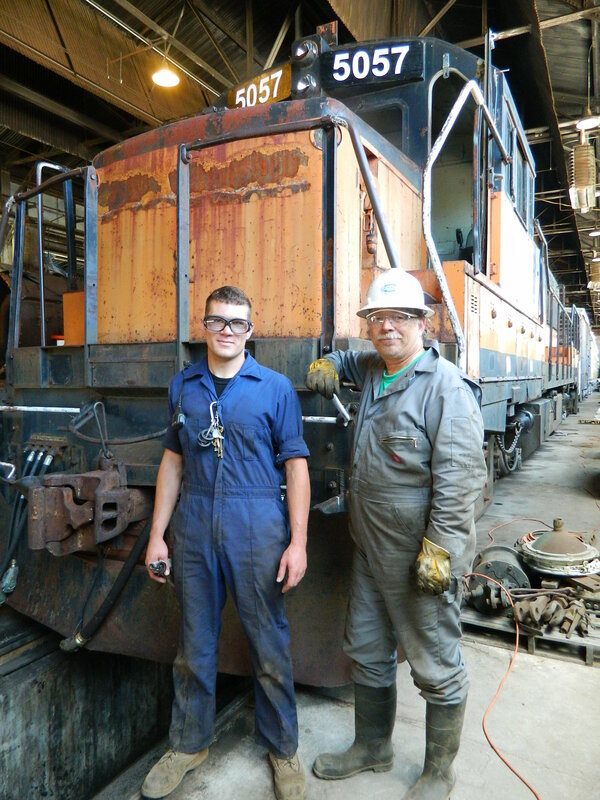 Wayne and David cut a piece of 3/4″ plywood to fit over the opening and secured it to the locomotive body using self-tapping steel screws. 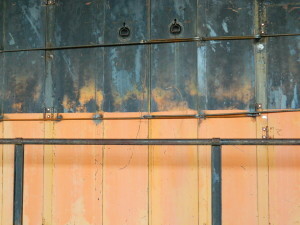 They painted it with black and orange so it will not be very noticeable. Fresh orange and black paint! 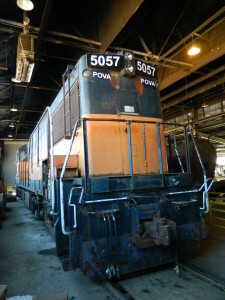 The 5057 is ready for its pre-movement inspection.